The ensemble of “Traces.” Photo by Michael Meseke. On Monday, 7 Fingers circus performer Bradley Henderson boarded a plane for Los Angeles for the Music Center debut of Traces, which opens Friday at the Dorothy Chandler Pavilion and runs through the weekend. Fresh off a three-week break from the US tour, he’s excited to re-unite with the cast as well as the show’s directors/choreographers, Shana Carroll and Gypsy Snider, who choreographed the circus scenes for the current Broadway revival of Pippin and have been busier than usual, preparing for its opening night Thursday. Henderson and these two (out of seven) founding members of Les 7 doigts de la main (7 Fingers) go way back. They all met in San Francisco, where their individual passions for circus were piqued, and then headed to Montreal, the epicenter of modern-day circus. In 2002, seven like-minded circus lovers in Montreal — Carroll, Snider, their husbands and three former circus colleagues — decided to form 7 Fingers. 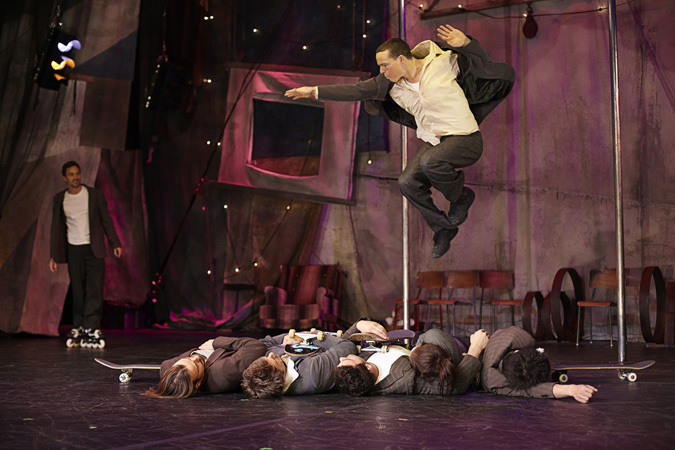 Its first production was Loft, and the company went on to create a string of wildly popular shows, which although different in setting offer the same 7 Fingers style of blending circus with dance and theater. Most important, the performers play themselves, without makeup and costumes, and each new added cast member brings his or her personality and talent to a production.